The fifth edition in Dan and Dave's line of playing cards is basically a blue V4 with a few extra details. Like their predecessor, they are printed on Aristocrat stock with an Air-Cushion Finish, and utilize metallic ink on the backs and court cards. The box states that these were also "Made from recycled paper". 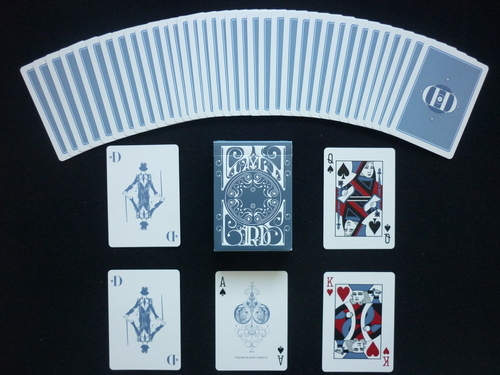 The Jokers, as well as the Ace of Spades, are printed in blue ink. It also comes with a blank faced gaff card, whereas all the previous versions came with a double backed gaff card.